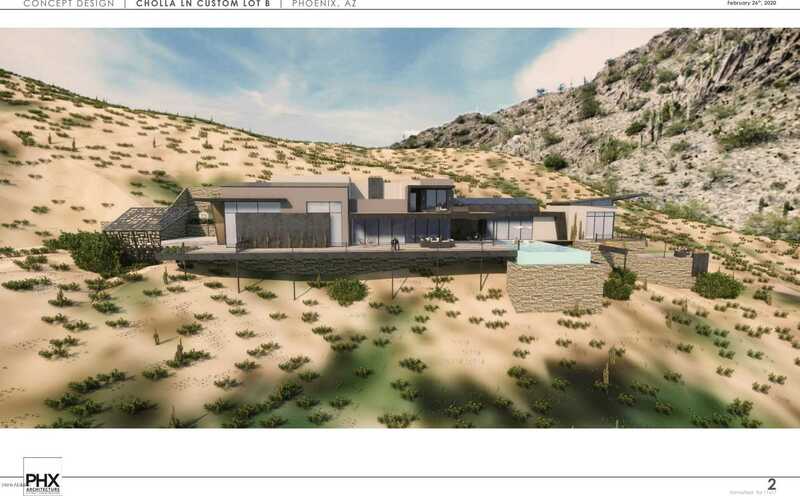 LOT B – 1.99 ACRES AT THE TOP OF THE MOUNTAIN with amazing Panoramic and Scottsdale City Light Views and absolutely fabulous Rock Out-croppings. Eric Peterson of Phoenix Architecture did conceptual site drawings, placing the driveway and building pad to optimize best site use. Lot A and B were originally two lots that the owner combined and can be separated again. There is a water line on the street in front of the property. We believe this property may also be able to hook up to a private sewer at the cul-de-sac. Separating the lots back to their original state should be an easy approval.25% lot coverage allowed of 82,030 s.ft is20,507 sq ft. Taxes listed are an approximation based on1/2 of stated taxes prior to lot split. Dimensions: 1.99 acres 82,030 sq ft.